The Purchaser may return any item that does not work to specifications for a FULL REFUND up to 30 days after receipt of purchase. Purchaser may return, for a FULL REFUND, any item that works to specifications, but does not perform as purchaser hoped it would up to 30 days after receipt of purchase. Purchaser may return, for a FULL REFUND, any item that works to specifications, performs as intended (but you don’t like the color or the way it looks) up to 30 days after receipt of purchase. Bid Service 3-Month Equipment Warranty. 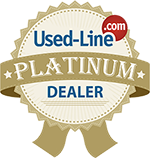 The following warranty applies to all equipment sold by Bid Service, LLC with the exception of any item sold “AS-IS”. AS-IS items are not covered in any manner by the warranty. 1. Bid Service, LLC warrants equipment to the first-purchaser and at the original point of delivery/installation to be free from defects in materials and workmanship for 3 months from date of delivery. 2. Bid Service, LLC includes a 30-day Right of Return on all systems as described above. 3. Bid Service, LLC agrees to replace parts which are determined to be defective during the warranty period. Such parts may be replaced with new, refurbished or used parts at Bid Service’s discretion. Consumables are not covered by this warranty and are the responsibility of the purchaser. 4. The customer is responsible for all freight, import duties, customs charges for any replacement parts provided under the terms of this warranty. 5. The customer is responsible for the return of the defective parts being replaced to Bid Service, LLC. 6. Bid Service, LLC will ship replacement parts as expeditiously as possible, subject to availability and shipping considerations. 7. The warranty does not cover the cost of a technician visit to replace the parts if such visit is required. 8. The warranty does not apply to any failures caused by accident, act of war, misuse, abuse, negligence, acts of God, improper shipping or installation, or alterations performed by the customer or their technicians. 9. If repairs are not deemed cost-effective, Bid Service, LLC reserves the right to offer a refund of purchase price. Item must be returned at customer expense to Bid Service, LLC. 10. In order to receive a full refund under this warranty or the 30-Day Right of Return, items must be returned to Bid Service in the condition they were delivered to the customer in, with all components and supplies shipped with the item intact. 11. Bid Service, LLC technicians are available during our normal business hours to provide what support they can on items that are covered under this warranty, via phone or email. Purchaser is liable and responsible for ALL FREIGHT CHARGES. In the event of a return, the Purchaser is also liable and responsible for return freight and charges. Returned items must ship insured by the same method as originally sent to purchaser. All items returned must be in the same condition as when they left Bid Service. All Purchase Orders must be in writing. No verbal Purchase Orders can be accepted. We do NOT sell “AS IS” unless stated. AS-IS equipment does not qualify for our 30-Day Right of Return. The 30 day Right of Return does NOT apply to any NEW products we distribute for manufacturers or we manufacture. These new items are covered by the manufacturer's warranty if any. New items we are offering for 'resale' are covered by the 30 Day Right of Return unless otherwise specified. The 30 Day Right of Return policy does NOT apply to dealers. All orders are subject to availability. If an item has been sold, we will try to find you a suitable substitute. Crating fees are an additional charge. Y2K/Suitability for use: It is the responsibility of the end-user to determine if the equipment sold by Bid Service, LLC will meet their needs and perform the functions needed. Our "30 Day Return" policy allows the end-user time to determine suitability for their application, including "Year-2000-Compliance." Any licensing fees involved in utilizing software on equipment we sell are the sole responsibility of the end-user (or buyer). This includes chip based embedded code or code on disk, be it software or machine code. Bid Service, LLC makes no warranties, expressed or implied of any kind, except as set forth. Bid Service, LLC makes no warranty as to product fitness for purpose or use, whether known or unknown by Bid Service, LLC as to PURCHASERS intended use and purpose for a product. Bid Service, LLC will in no way be liable to a potential buyer for any loss they suffer by failure on their part or on the part of Bid Service, LLC in completing the transaction. By the act of purchasing any equipment from bidservice llc the buyer hereby releases and holds-harmless Bid Service, LLC and it's employees and officers from all claims arising out of use or misuse related to the equipment purchased. The process involves fully testing the equipment to ensure that it meets the original manufacturer’s specifications. Any parts that are found to be defective are replaced. If needed, certain visible surfaces of a system may be repainted to improve its overall appearance. Bid Service only employs professionals who are highly qualified to perform each phase of the refurbishment. Some equipment may contain scratches or minor imperfections as a result of age or use, but we inspect and confirm that they do not interfere with the functionality of the equipment. We encourage you to come to our facility to sign off on a demonstration to ensure that you are satisfied with the appearance and functionality of the product. We offer a thirty day money back policy to allow you time to decide if you are completely satisfied with your purchase. We do our best to make sure that every refurbished product is delivered in excellent condition, but it is used and will not have the appearance of a brand new piece of equipment. Bid Service has been refurbishing equipment for over 25 years and has established a very large and satisfied customer base. Again, we encourage every potential customer to visit Bid Service, view the equipment, and see a demonstration first hand, so that you will be completely satisfied with your choice. If you are not able to visit Bid Service in person, we will gladly produce a video of the demonstration to your satisfaction.